Seller: AB3DLabs Company, ©AB3DLabs (Simprex 3D). WHAT'S NEW IN AB3DXtd versus AB3DBasic? Supports designing complex 3D shapes. Supports 2D Drawing with 3 layers. 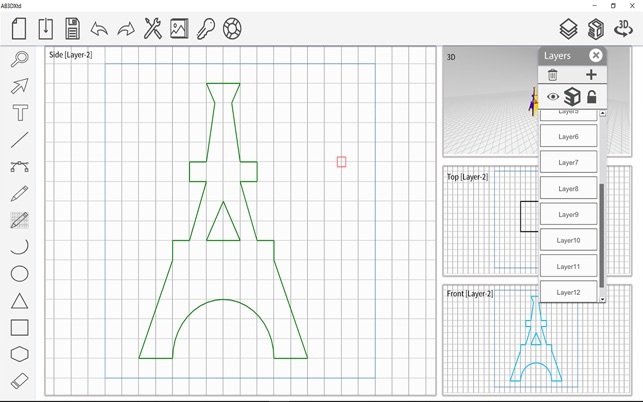 AB3DXtd is AB3DLabs’s simplest design software that targets beginners in the 3D printing world, who have minimal to no design experience at all. 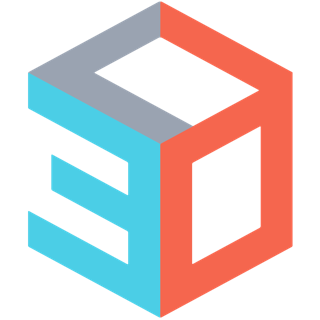 It is an introductory app that familiarizes users with the concept of 2D to 3D transformation, before they can upgrade to the more sophisticated software: AB3DFull, AB3DPro. AB3DXtd introduces users to a new 3D modelling concept that relies less on manipulation of objects in 3D space, and more on 2D view integration. This concept allows users to change the way they perceive 3D design, and take on projects with a different mindset. 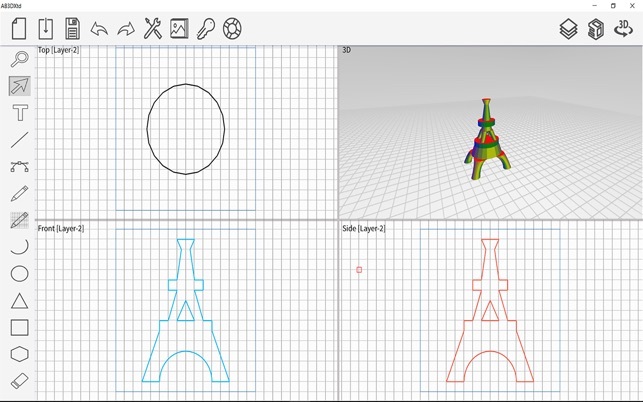 By sketching on the three faces of a cube, or using the front/side/top view modelling, young minds can learn how 3D objects are created out of 2D shapes. 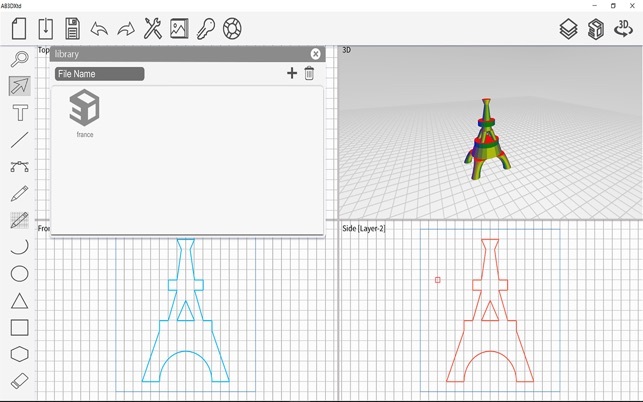 It offers them a quick but precise way to create 3D models. 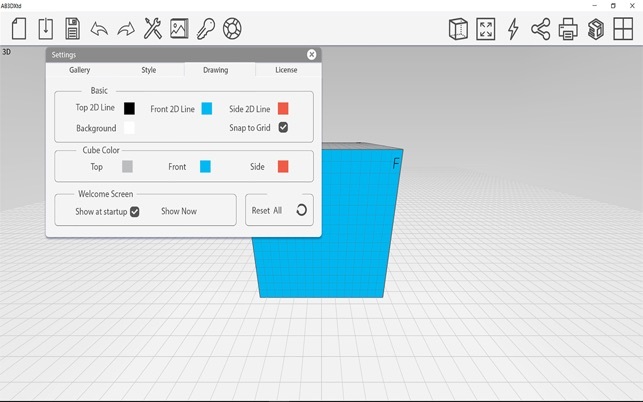 With the simple interface, it takes less than 5 minutes to learn how to use the program, as well as supporting cross-platform integration (generates .STL and .OBJ formats which are compatible with other CAD solutions). Designed for all popular platforms (iOS, Android, OS X, Windows). Lean interface with minimal interference with the design. Every tool within mouse reach. Your Models can share on Facebook with the touch of a button. Export models in .STL, .OBJ. New file, Load file, Save file, Settings, License, Solve, Layers, 3D Printing. Copy, Cut, Past, Move, Scale, Rotate, Select. Square, Hexagon, Circle, Triangle, Eraser, Grid Pen, Free Pen, Text, Line, Curve, Arc, Zoom, Reset Zoom and Select. 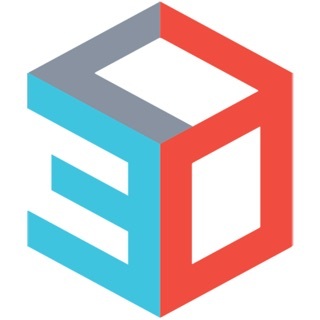 Text 3D ( English Language). Select and load it in the app. Copy front to front and side and draw circle to top. Copy front to all projection. Copy front to front and side and draw square to top. Draw square top and side. OS X (El Capitan, Sierra ), Processor: 1 (GHz), RAM: 1 (GB), Free hard disk space: 100 MB. 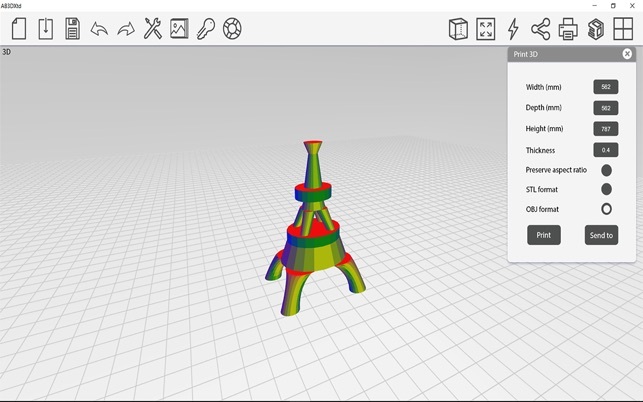 Supports Load file, Save file, Settings, 3D Printing features. Supports drawing with Square,Arc, Grid Pen features. Supports exporting to .STL and .Obj Capabilities.